Microfiber suede sofas are beautiful additions to any home, but their tiny fibers can make cleaning a real pain. Follow these easy steps to freshen your favorite piece of furniture, leaving it with a like-new look. A microfiber suede sofa is a cozy centerpiece for any room. Known for being soft and stylish, this popular seating choice makes itself right at home in any gathering spot. One drawback, however, is that the fabric can be tricky to clean, as there are various types of microfiber suede that each require different scrubbing methods. Simplify the process and keep the most comfortable seat in the house fresh by following this easy cleaning routine. Microfiber suede fabric is composed of tiny synthetic fibers designed to ensure that your sofa remains more durable and stain resistant. If there’s ever a spill, they cause liquids to bead first before soaking into the fabric, allowing you to quickly grab a paper towel and wipe up the mess before any major damage is done. But because these fibers are so small, they also make it more difficult to remove forgotten spills. As often as you can, treat immediately. • W-labeled sofas can be cleaned with a water-based solution. • S-labeled sofas will be stained by water and must be cleaned with a special solvent. • The label S-W means that you can clean with either a solvent or water. • An X label means that no liquid should be used on the sofa at all—only a vacuum. To determine the classification of your sofa, check the tags that may be hiding on or underneath the couch. If you can’t find the label, consider moving forward as if it is an S-labeled model, just to be on the safe side. You should also always test a small spot first with any cleaner you use to ensure that it doesn’t stain. 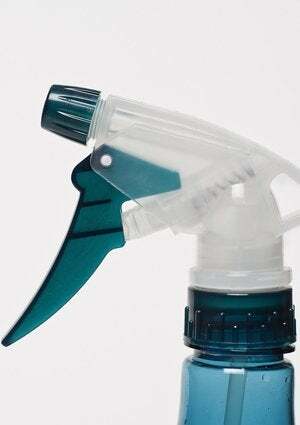 Find a clean spray bottle to store your solution and make application a cinch. If you’re working with a W-labeled sofa, create a water-based mixture of warm water and a few drops of mild dish soap. (To neutralize odors, also add a teaspoon of baking soda or white vinegar.) For S-labeled couches, fill your spray bottle with rubbing alcohol. Note: If you’re working with an X model, you’ll want to skip the spray-on cleanser all together and opt to use the upholstery attachment on your vacuum to remove any dirt or debris from the surface of your sofa. For S- and W-labeled couches, spray the specific stain you’re hoping to target, or work on one area at a time if you aim to freshen the entire sofa. Don’t soak the cushions—you’re going to want it to dry eventually—but do dampen it enough to loosen the dirt. Then, rub a soft towel or a sponge (either should be white, so no color transfers while you work) in a circular motion over those sections that are saturated with cleanser. 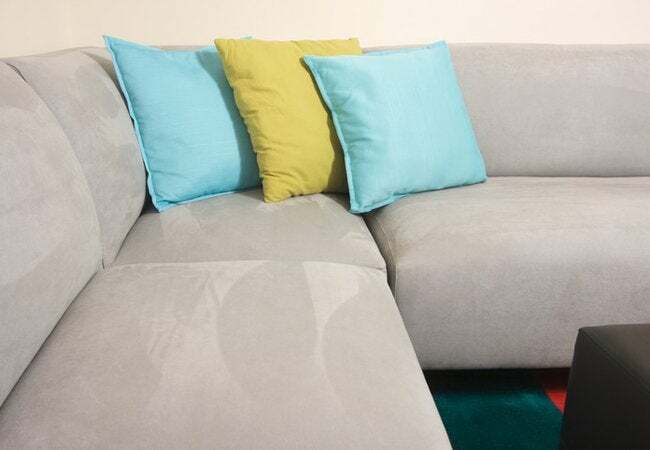 The spraying and rubbing might make the couch look darker or mussed at first, but don’t worry; the microfiber suede will return to its normal self when it’s clean and dry. Once the fabric feels completely dry to the touch, use a soft scrub brush to gently rub it. This will help fluff the fibers, making the material feel soft and look brand-new again.